Podlehnik (pronounced [pɔˈdleːxnik]; German: Lichtenegg) is a settlement and a municipality in the Haloze Hills in eastern Slovenia. 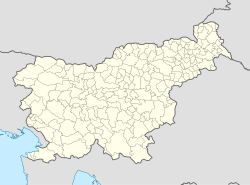 The area traditionally belonged to the region of Styria. It is now included in the Drava Statistical Region. The settlement developed around 13th-century Lehnik Castle. The castle was destroyed during Ottoman raids in 1532 and very few traces of it remain (foundations of a tower and a defense ditch). What was originally the castle chapel is now the local church, dedicated to the Virgin Mary, and was expanded in the 16th and 18th centuries. The municipality of Podlehnik covers a total area of 46.0 square kilometers (17.8 sq mi) in the Drava Statistical Region. It consists of a few villages with a total population of 1,865 in 2018. ^ a b "Število prebivalcev, naselja". Statistični urad RS. Retrieved February 19, 2019. ^ Leksikon občin kraljestev in dežel zastopanih v državnem zboru, vol. 4: Štajersko. 1904. Vienna: C. Kr. Dvorna in Državna Tiskarna, p. 238. This article about the Municipality of Podlehnik in Slovenia is a stub. You can help Wikipedia by expanding it. This page was last edited on 19 February 2019, at 11:18 (UTC).